Morakniv knife blade blanks are an excellent choice for anybody wishing to make their own custom knife. The Morakniv 120 Wood Carving knife blade blank features a 2.3-inch laminated carbon steel blade which is well-known and appreciated among wood carvers in Sweden. It has a thin, tapered laminated steel blade which is constructed around a core made with high carbon steel surrounded by a softer alloyed steel layer. As a result of this lamination, a very high edge hardne6ss (Rc 61-62) can be achieved for superior edge retention while at the same time having a blade that is very tough. Morakniv has been manufacturing the highest-quality knives in Mora, Sweden since 1891. Professionals worldwide trust the quality materials and fine craftsmanship of Morakniv. 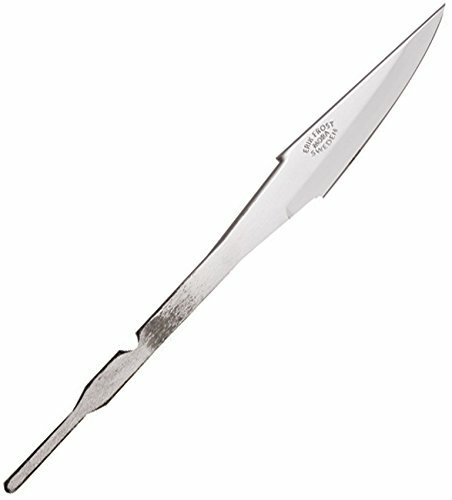 Knife blade blank only, does not include handle or sheath.